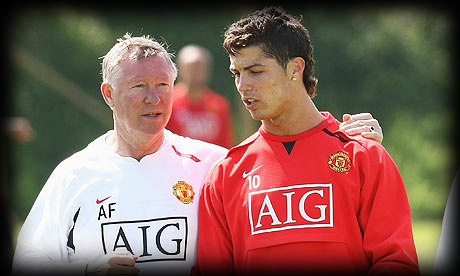 Manchester United coach, Sir Alex Ferguson, granted an interview to "The Guardian" and said that he would pick Cristiano Ronaldo over Lionel Messi. The Scottish coach admits both players are fantastic, but he confesses that CR7 is a more complete player, by praising all of his qualities. The UEFA Champions League returns this week and besides the major clash between Real Madrid and Barcelona, the other semifinal will oppose Manchester United to Schalke 04. Alex Ferguson granted an interview to the English newspaper "The Guardian" and talked about his wish of hiring Raul, currently playing for Schalke 04, but also made a few interesting notes on Cristiano Ronaldo and Lionel Messi. Manchester United coach, Sir Alex Ferguson, said that the club thought about transfering Raul to Old Trafford, but the ammount of strikers available at the moment somehow reduced the chances for that to happen. "We had conversations with Raul's agent about the possibility of signing him, but because we got so many players for that position, like Wayne Rooney, Dimitar Berbatov, Javier Hernandez "Chicharito" and Michael Owen, we just decided not to go forward with it. The Scottish coach was then asked to make a comparison between Cristiano Ronaldo and Lionel Messi. Ferguson: "Messi or Cristiano Ronaldo? They are two great players. I've got a big loyalty for Cristiano Ronaldo and I know very well the qualities he possesses. He's truly unbelievable and a fantastic player with both feet. He's also quick and great in the air." Regarding Lionel Messi, Sir Alex Ferguson also praised the player, but in a softer way: "Lionel Messi is a different type of a player in general, but he also has enormous qualities and brings a lot of value to any team in football." Remember that you can watch Real Madrid vs Barcelona livestreams, for the first leg of the UEFA Champions League, online here on ronaldo7.net, this Wednesday. Cristiano Ronaldo will most certainly be on the starting eleven.